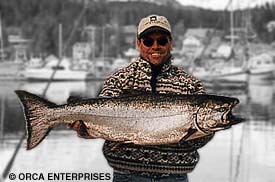 Orca Enterprises invites you to enjoy a personalized South Eastern Alaska fishing adventure. 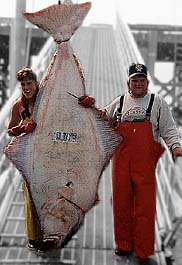 We offer Salmon and/or Halibut fishing charters for a cooperative group of independent charter boat owners. This is a select group of quality fishing vessels. All vessels have warm, comfortable cabins, enclosed restrooms,flying bridge and lots of fishing room on the back deck. Fully equipped with state-of-the-art fishing and navigational electronics, fishing tackle and gear. The operators of these vessels are experienced, US Coast Guard licensed captains specializing in fishing charters. We schedule no more than 6 fishermen per vessel allowing plenty of room for passenger comfort and fishing enjoyment. Fishing licenses are available on board. Bring plenty of film for your camera and your lucky fishin' hat. South East Alaska fishing adventures can be booked for half-day fishing (4 hrs on the water), full-day fishing (8 hrs on the water), multi-day and overnight trips. Snacks and beverages are served on board. Lunch is provided on full day trips. Custom processing and shipping of fish is available. All trips include round trip transportation from ship or hotel, hot and cold beverages and snacks. Lunch is provided on full day trips and all meals are included on overnight trips. Bring the whole family or just your favorite fishing partner. Our goal is to provide you with the most enjoyable and productive fishing trip possible. Majestic scenery, abundant wildlife and waters teeming with fish could make this the trip of a lifetime or an annual adventure.